1600grand planned maintenance Saturday March 16 and Wednesday March 20, 2019. Outage expected. Saturday March 16, 2019 6am - 12pm: Planned outage. All Systems and Self Service Applications listed below will be unavailable. Wednesday March 20, 2019 from 8am - 12pm: Planned intermittent disruption of service. Expect intermittent disruption of service when accessing only Self Service Applications listed below. If you have any questions or would like more information, please contact the ITS Help Desk at helpdesk@macalester.edu or 651-696-6525. Form description: include identifying information, for example: Macalester College, Department, department website address, etc. File upload: When using this question type, the Form MUST be stored in My Drive. The File upload question type is not supported in Team Drives and will appear grayed out. My Drive or Team Drives? Storage location matters depending on who is filling out your form. If you want people from your own department to fill out the form and they are members of your department’s Team Drive, you may not want to store the form in that particular Team Drive, since members of Team Drive will automatically have edit permissions to Form. Decide if that’s appropriate. Collaborators: Share with appropriate collaborators who you trust to edit the form. View-only collaborators is not an option. Get the right Link to your responders! Check Shorten URL: you can never go wrong by using the shorten URL! Subject: Form name is default, but you can change it. Look at the responses spreadsheet. Are you getting the information you want? Tweak the questions as necessary. Test with incognito browser window. Are you prompted for Google Sign In? Is that expected? Use Shorten URL or send via email. NEVER EVER copy the URL from the browser window. It’s too easy to copy the editor’s version of the form. 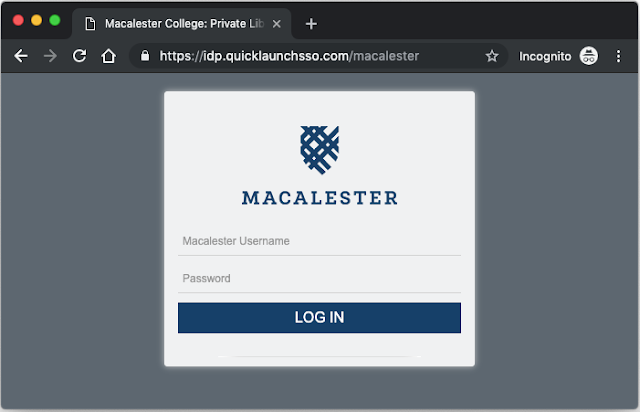 When did Macalester's New Log In screen appear? Transitioning applications and services began during the week of spring break and continued through the first week of April 2019. During the transition from the old SSO to the new, you may have been prompted to log in again, when moving from one application to the next. Single sign-on (SSO) is a type of authentication process that allows you to access multiple applications with one set of login credentials without needing to sign in again. The SSO website address is new too! When you log into an application that is behind our new SSO environment, like 1600grand, you may notice that the website address looks different. This is by design and it's okay to proceed. Contact the ITS Help Desk at helpdesk@macalester.edu with questions or comments.